Warthin’s tumor is the benign tumor of salivary glands. In this tumor excess lymphocytes and germinal centers are present. The germinal centers are the lymph node like stroma. Papillary cyst adenoma lymphomatosum is another name of Warthin’s tumor. This tumor was named after a scientist named aldred Scott warthin. It mostly occur in middle aged man. The tumor appear as a parotid mass. 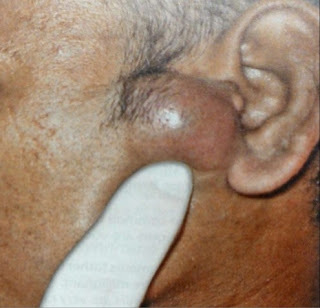 The tumor appear as a painless bump which is slow growing and present in front of the ear. The size of Warthin’s tumor increases with time but only a few cases turn into the cancerous. The Warthin’s tumor occur most commonly in parotid glands. Parotid glands are the largest glands producing saliva. They are present on both sides of face right in front of ear and above the jaw line. The most reported cases are of bilateral warthin’s tumor i.e. about 5 to 14% and others are the multicentric tumors reported i.e. about 12 to 20% of cases. In multicentric tumor, there are no. of tumors present in the either side of face. The tumor is painless and appear a bump. The growth of the warthin’s tumor may slow but with time it may turn into cancerous one. The exact cause of the warthin’s tumor is unknown till now but researches tell that it can occur due to excess smoking. The chances of occurrence of warthin’s tumor is much more in smokers as compare to normal healthy person. The person who are more exposed to the radiations like radiologists may also be on target of warthin’s tumor. It may be secondary to diseases including auto immune diseases which causes the activation of immune system of body and lead to the warthin’s tumor. It is a rare disease reported yet. Warthin’s tumor is non-recurrent. There are two type of treatment plans and the treatment is selected according to the condition of tumor. It is either treated via non surgical method or a surgical method. The non surgical method involve the chemotherapy in which the antibiotics are injected against growing tumor cells and radiation therapy in which the tumor is eliminated via radiations. But these treatments are rarely needed. The most commonly used treatment is the surgical removal of the warthin’s tumor. After surgery, it will not occur again because of the removal of all tumor cells spreading. Warthin’s tumor is removed surgically as a last option of treatment when medications are of no use. The surgical removal of warthin’s tumor is the widely used treatment of warthin’s tumor. In surgery, an incision is made on the bulged out mass of tumor by taking the patient under general anesthesia. After incision, the tumor cells are removed and after cleaning the area, the incision is sealed again with stitches. The wound should be checked properly and cleanliness is also required. The post-operative tests are also performed to check that the tumor is again growing or not.